We are “sweetening the pot” a bit. 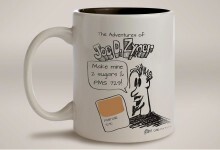 We will also be giving away one of these awesome Joe D. Zyner coffee mugs via a random drawing when we hit 200 followers/fans. On the mug is Joe’s creative take on how he prefers his morning coffee. Also, look for new JDZ comics on a new and improved website coming very soon. Visit the old Joe D Zyner website. 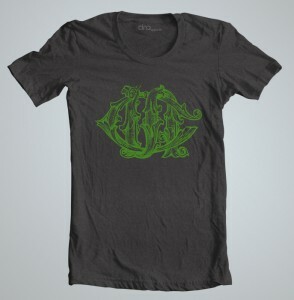 Win a CINQ Monogram T-Shirt! To celebrate the upcoming launch of our new CINQ Apparel site, we are giving away 2 of our our first-run, uber-sweet CINQ Monogram tees. This pre-shrunk cotton, tagless…..BLAH BLAH BLAH. It’s a sweet heather gray tee in lime green featuring a large CINQ monogram logo on the chest and small CINQ logo on the back. So, How Do I Win One? It’s pretty simple. We are giving away 2 t-shirts. One on our Facebook page, and one on our Twitter account. We will give away 1 CINQ Monogram t-shirt to a random fan when our page reaches 250 fans. We will give away 1 CINQ Monogram t-shirt to a random follower when our account reaches 250 followers. Connect with us on both Facebook and Twitter and you double your chances of winning. You’re also connecting with three crazy awesome designers….and that is prize enough, am I right? Get a Shirt. Send Us a Pic! When you win your CINQ Monogram t-shirt. Show it off! Take a picture of you in your sweet tee, post it to Instagram and tag with #cinqapparel. You could be on our site! See some of the pics already posted below.